12 Month replacement for manufacturing defects. 24/7 Customer Support Service, If You Don't Like it Simply Return. High pressure-resistance durable latex; Normal operating water pressure: 43.5-87PSI/3-6Bar; Safe operating water pressure: under 8 Bar. 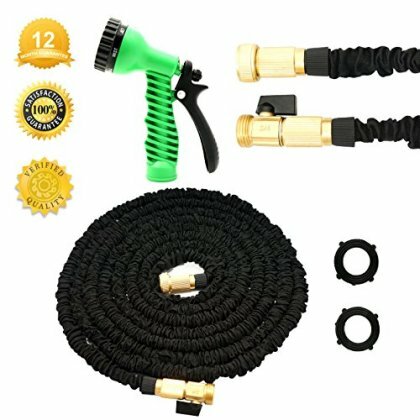 50' Expandable Garden Hose comes with a high quality spray nozzle with 7 adjustable patterns and brass connectors, excellent corrosion resistance and durable quality. Never tangle, twist or kink, flexible expandable hose, easy to handle and storage. **IMPORTANT NOTE - Please do not leave expandable hose charged after you switch off the valve on the brass connector, which would damage the latex and may cause a burst. Please keep the hose empty when not in use. We've got one of theses there really, saves a lot of space not like others big and bulky. If you get a chance to get one of these I recommend you do, you won't be sorry. We've got all the add ons which are really good.